This week we are excited to have a guest post by Deborah Kohl Kremer. Deborah is a local freelance reporter and author of An Explorer’s Guide; Kentucky. We also have an awesome giveaway at the end of the post. As the summer season approaches, we tend to look forward to the longer days, warmer temperatures and finding an answer to the familiar question, where are you going on vacation? One way to end the monotony of looking for hotel deals from the former commander of the Space Ship Enterprise, counting up for credit card points for a stand-by airline seat, and trying to figure out if your family can fit in a compact or an economy rental car, is to cast it all aside and put your efforts into a Staycation. Sleep in your own bed, make breakfast in your own kitchen then hit the open road, finding destinations full of outdoor fun, history lessons, and even….. right here in Kentucky, all take about a two hour drive or less from Kenton County. 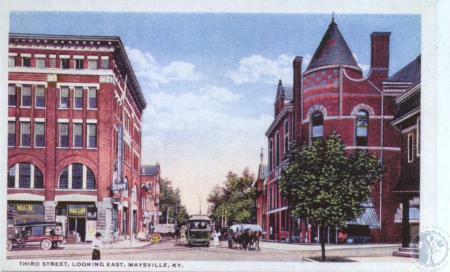 Head east to the darling river city of Maysville. In addition to their walkable downtown with cute shops, restaurants and art galleries, Maysville is home to the Kentucky Gateway Museum Center a fabulous place to learn about the area. Actually three museums in one, they host a historical reference library, a regional history museum and a miniatures museum. The first two are a history-lovers paradise, but if you have anyone in your party who is not all that into history, it is hard to not be captivated by the Kathleen Savage Browning Miniatures Collection. The collection is giant but each scene, house and room is a recreation created on a 1/12 scale. Think teeny, tiny. If outdoorsy activities are on the agenda, hiking trails of all levels can be found in all parts of the Bluegrass State. Some as close asinside Highland Cemetery in Ft. Mitchell, and the 2 mile walking path through the Boone County Arboretum at Central Park in Union or you can head for some heavy-duty hiking at the Red River Gorge and adjacent Natural Bridge State Park. Situated in the heart of the Daniel Boone National Forest, the gorge features limestone arches, rugged terrain, scenic vistas and looks much the same as it did back when Daniel first paid a visit in the late 1700s. Many of these attractions are the destination of hiking trails, but several are situated near roads and parking areas so if you really are not into hiking, you can still get there. 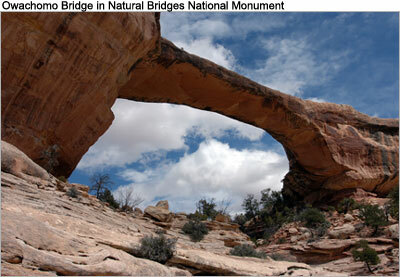 At the Natural Bridge, they offer another attraction to get to the top: an unexpected ski lift. This lift travels the ½ mile up the mountain and drops you off within walking distance of the bridge. It is a scenic way to get to the top, but only recommended for those who are not afraid of heights. What’s a Kentucky Staycation without some horses? Head down I-75 to Louisville and set your sites on Churchill Downs. Not only the home to the famous Kentucky Derby for more than 100 years, Churchill is also home to the Kentucky Derby Museum. This interactive museum lets you climb into an actual starting gate, see trophies the equally-famous ladies hats from past derbies, and watch the 360-degree high-definition presentation called The Greatest Race, taking viewers through the process of what it takes to win the Kentucky Derby. Don’t forget to sign up for a backside tour of Churchill while you are there. The van-tour gives a fantastic perspective into the world of horse racing. And, of course, if Churchill has live racing going on, go ahead and plunk $2 down on the longshot. Who knows? Your winnings might pay for your lunch. All of these Staycation tips can be beefed up or scaled back. Pack your lunch and eat at a nearby park or rest area or do a little research and look for a nearby mom and pop restaurant. If you don’t want to spend money on a meal, maybe just a little treat from a locals-favorite bakery or candy store. 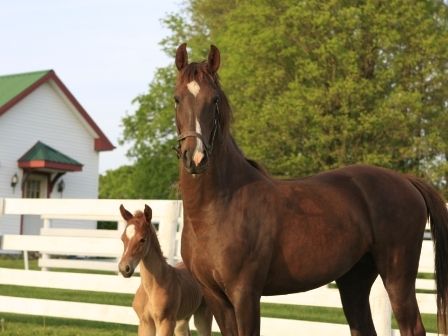 Kentucky offers a myriad of things to do and places to see. Sometimes the best part of any of these destinations is the journey to get there. Enjoy your travels as well as your companions. 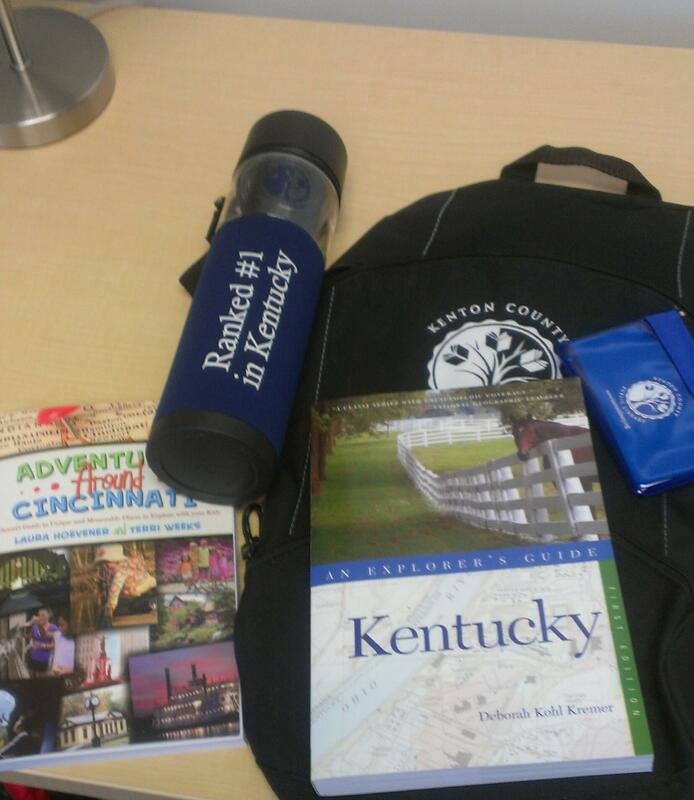 We are giving away an autographed first edition copy of “An Explorer’s Guide; Kentucky” by Deborah Kohl Kremer, an autographed copy of “Adventures Around Cincinnati” by Laura Hoevener and Terri Weeks, a Kenton County Public Library water bottle, a KCPL backpack and a KCPL key chain card holder. You can enter several ways. Be sure to comment separately for more chances to win. Enter by noon on Monday, May 13. We will randomly choose a winner through random.org, who will be announced on our Facebook page and emailed. 1. Comment on this post saying where you would like to visit in Kentucky (required to enter). 2. Tell us what your favorite resource for a Kentucky staycation is. Disclaimer: The authors donated the books to the Library for the giveaway. The winner must pick the prize up at the Covington, Durr, or Erlanger Branch Library. Library employees and those living in their household are not eligibile to win. “Hiking Kentucky’s Red River Gorge : your definitive guide to the jewel of the southeast” by Sean Patrick Hill. There are hundreds of books about Kentucky at the Library. Stop by any of the locations and ask a member of the reference desk to help find the right book for you.